Throughout the month of June, the Gulf of Mexico was teeming with GoMRI-funded scientists conducting oil-spill related research. For some of the research teams Tropical Storm Debbie provided additional challenges, requiring some schedule changes. Research teams are sampling and collecting data for studies about the Deepwater Horizon oil spill to support improved response efforts in the future. Scientists with the Deep-C consortium completed an ecology cruise to sample fish along the continental shelf, slope, and deep sea. Both the geomorphology cruise and microbial ecology cruise to the De Soto Canyon had to be rescheduled because of TS Debby. Deep-C also used time in June to gear up for two July cruises and several more that will take place in August and into the fall. ECOGIG team members were involved in three research cruises in June. Some of the team were able to piggyback on a NSF-funded cruise that started in May and ended in June. The same ship was then used on an ECOGIG-funded cruise porting from Gulfport. Even though approximately four days were lost as departure was delayed due to TS Debby, the rest of the cruise was highly successful doing water column and sediment sampling at sites near and west of the spill site. TS Debby caused a third cruise on a different ship, dedicated to seafloor mapping of study sites, to spend several days in sheltered locations before the cruise was terminated. ECOGIG was able to work with the ship provider, LUMCON, to salvage seven cruise days for use in September. Research teams with C-IMAGE continued work on assessing zooplankton and imaging oil droplets on the west Florida shelf, but this cruise was also cut short due to TS Debby. They made mid-cruise adjustments, sampling stations from Tampa Bay out to the shelf that were not affected by the weather. CARTHE collected core samples and water samples along the continental shelf and at sites east of the spill site. They also completed a field test in preparation for their deployment of 300 drifters to collect information on ocean currents. Researchers learned that they will have to factor in atmospheric conditions that are lingering from TS Debby for the July drifter deployment. GISR made preparations for two multi-week cruises scheduled in July: one to collect samples for tracing oil and gas and to deploy six deep-water current meter moorings east of the Mississippi canyon, the second to inject an inert tracer at 1100m depth that will be followed over the next year to provide information on deep dispersion. “Marsh Madness” started in June as LUMCON led a large group in sediment sampling of both oiled and non-oiled sites in Louisiana’s Terrebonne and Barataria Bays. This field work will continue into July. Researchers from LUMCON, Louisiana State University and Agricultural Center, Rutgers University, the University of North Carolina, the University of Tennessee, the Marine Biological Laboratory, and Connecticut College were involved in this effort. 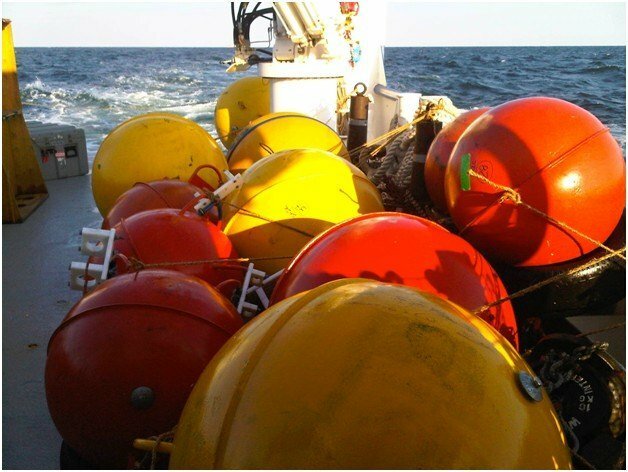 For additional information about the cruise programs and field research, see: overviews of the C-IMAGE cruise program and CARTHE cruise program, and researchers and students blogging about their sea experiences on the Deep-C Voices from the Field website. Learn more about ECOGIG deep sea autonomous vehicles used during their research cruises. Read more about LUMCON’s marsh field work.